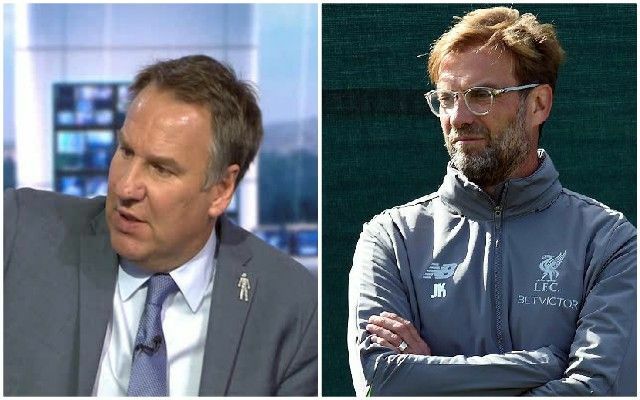 Paul Merson insists Liverpool must deal with a new pressure when they face Manchester United on Sunday. The Reds enter the matchup looking to maintain their lead at the top of the Premier League table on the back of Manchester City’s slip up against Chelsea last weekend. Jurgen Klopp’s men face a United side down in sixth place and 16 points behind them having won just one of their last five league games. Whilst history suggests form goes out the window in such a high profile fixture, Merson believes United are there for the taking. Though physically draining, Tuesday night’s win over Napoli may have been ideal preparation for the intensity and bravery required against Jose Mourinho’s side. It proved a welcomed reminder of Liverpool’s danger on the front foot, not to mention their ability to break a team down without relying on their counterattacking expertise. The altered approach Klopp has installed is designed to accommodate the kind of deep-lying setup United came to Anfield with last season. Sunday awaits as a chance for this team to truly flex its title credentials.